Now that Free-Motion Quilting with Angela Walters is due to be released in a couple of weeks, I have been busy promoting it. I have been featured on the local news, was interiveiwed on Pat Sloan’s Podcast and have done a couple of book signings as well. I am so pleased at the response that I have received. Check out the press page on my blog for the links to check the out yourself. And of course, none of this would be possible with the fabulous people that contributed to my book. Please check out the “Featuring” tab on blog to see all the people and products that made this book possible! Hi everyone!!! I wanted to share a sneak peek with you today. It’s not a quilt that I am working on or even a snippet of a new fabric line…..Instead, it’s a sneak peek of my book! The listing for my book on Amazon now has a “look inside” feature. Now you can check it out and see a sample of the inside…including some of the designs! 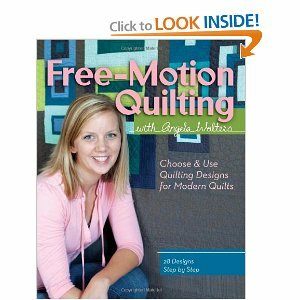 My book, “Free-motion Quilting with Angela Walters” is available for pre-order. You can order a signed copy from here and it will ship out the beginning of June.